Given the continuing heat here in the UK, hot drinks from Starbucks as a treat have dropped a little further down my priority list. I am well aware that there are some people who feel that hot drinks are more refreshing on a hot day than a cold, but I am not in that club. I am also aware that my lack of caffeine from coffee recently seems to have induced the odd headache, which is a bit worrying really. Seriously I only usually have the odd coffee at work, okay possible around five, plus the one I have with breakfast in a morning, plus the one after dinner in an evening…. Oh, its bad isn’t. That aside I have been drinking very little coffee the last few weeks, but I still have every intention of getting back to it when it becomes cooler. 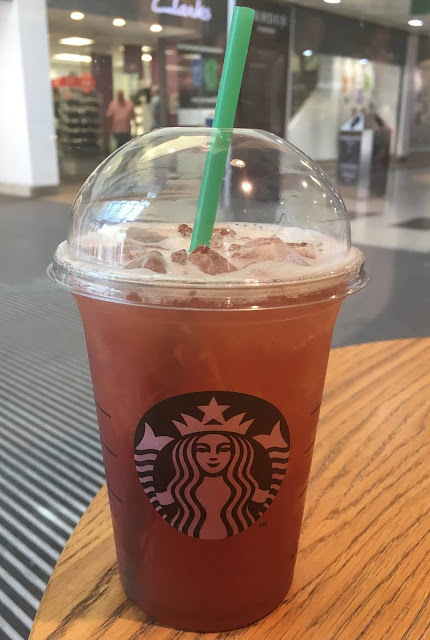 In the meantime I thought I’d see what new cold drinks Starbucks have that are new, ideally with a healthy serving of ice. I spotted on the menu this new Strawberry Teavana Black Tea ice drink and decided to give it a try. The first thing to note was that I was asked if I wanted it sweet, I asked for clarification on what they meant and they said they had a sugar syrup they could add, but that it was still nice without. I decided to try it without as I was after a more authentic black tea experience. I watched them make the drink and as per the Teavana spec it was indeed shaken to mix. The drink itself is deep strawberry red in colour, and looked very cooling, I was loving the generous portion of ice. I gave it a sip and was impressed with the flavour. It had a good strawberry taste that was sharp and zingy, but as promised not very sweet at all, it seemed to be similar to a more natural strawberry juice, which was rather refreshing. The lack of sweetness meant it tasted like a real fruit tea as the leafy flavour was also present. I thought this drink was just what I needed, refreshing with a good strawberry taste and not too sweet.